The world of work is changing at an ever increasing pace. To succeed, we must embrace new ideas and technologies, and strengthen Questers traits such as adaptability and flexibility. Adaptability and flexibility have meanings which are broadly the same but not identical. 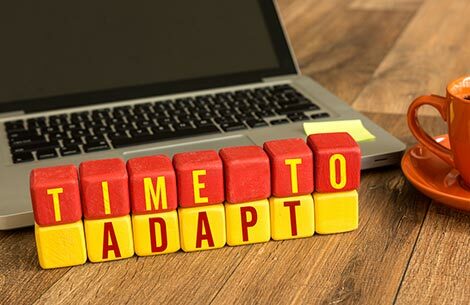 Adaptable indicates long-term changes; flexible more short-term alterations. One might adapt to the introduction of a new shift pattern, and be flexible enough to work late next Tuesday. Teachers adapt lesson plans to accommodate for the physical and intellectual needs of each student. They must also be flexible enough to handle unexpected circumstances, such as sudden illness or emergencies. Jobs that require workers to be adaptable and flexible include: Sales, Marketing, Advertising, Event Manager, Public Relations, Journalist, Broadcaster, Mental Health Administrator, Researcher, Teacher, Protective Services (Armed forces, Police work) Lawyer, Management Consultant, Hospitality jobs (hotel and restaurant managers), Self Employed entrepreneurs. - Continue to learn. Read, take courses. Challenge conventional beliefs. Find better ways to do things. Place no limitations on yourself. - Strengthen resilience. Approach problems from different perspectives. Ask for feedback from people with diverse backgrounds. Take things out of their ordinary context and create new patterns for them. Notice the number of ways you can use eggs or milk cartons. Develop a playful, childlike curiosity. Ask questions, experiment. b) Describe a situation when you demonstrated adaptability.